Human Rights Watch (HRW) on Friday called on Turkish authorities to release Italian writer Gabriele Del Grande, who was detained during a security check in the southern province of Hatay 12 days ago. 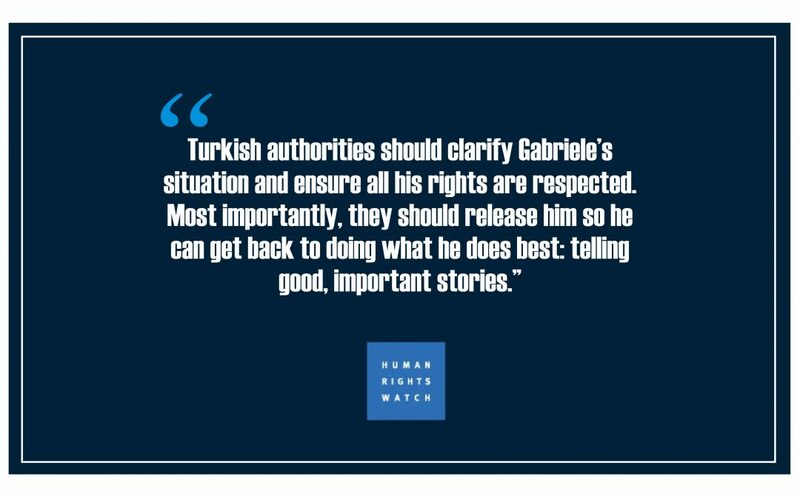 “Turkish authorities should clarify Gabriele’s situation and ensure all his rights are respected. Most importantly, they should release him so he can get back to doing what he does best: telling good, important stories,” HRW said in an article posted on its website. “After intense pressure from the Italian government, Turkish authorities allowed Gabriele to meet today [Friday] with the Italian consul and a Turkish lawyer. But the lawyer told Human Rights Watch that they were denied permission to see Gabriele’s administrative file and that there was no clear indication of an ongoing criminal investigation,” the statement said. According to HRW, under Turkish law this prolonged administrative detention appears to be arbitrary, and the lawyer applied this afternoon to a court for Gabriele’s release. Gabriele was only allowed a phone call after a week in detention. He was arrested on April 9 in Hatay province, near the border with Syria, where he was interviewing Syrian refugees for a book he is writing about the war and the rise of the Islamic State in Iraq and the Levant (ISIL). It is noted that Gabriele, who began a hunger strike earlier this week, is now being held in an administrative detention center in Muğla province, on the Aegean Sea. “Gabriele’s detention takes place in a highly repressive climate and crackdown on media freedom under Turkey’s state of emergency. About 150 journalists and media workers from Turkey are in jail, most of them facing politically motivated charges under terrorism laws,” HRW said in the article.